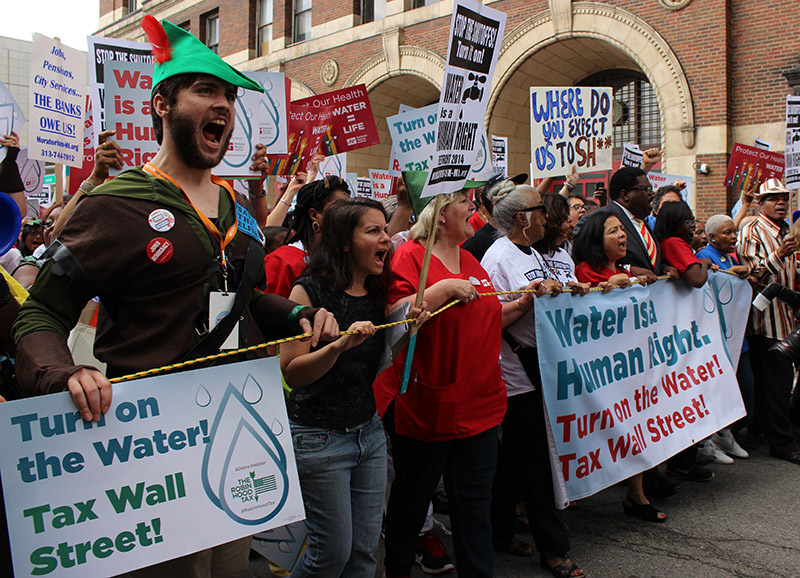 Declaring “Water is a Human Right,” hundreds marched in the streets of Detroit on July 18 to protest the city shutting off water services for thousands of residents too poor to pay their utility bills. Since March of this year, the Detroit Sewage and Water Department (DSWD) has cut off running water to over 15,000 homes, including over 7,000 families during the month of June alone. A third of the city’s $18 billion debt is due to DSWD. The collection of about $6 million in unpaid bills is the city's solution. Over 100,000 disproportionately poor people of color are at risk of losing water in their homes for bills over $150 or considered delinquent for over six months. Over 82 percent of Detroiters, and nearly one in four of all city residents, are Black. The shutoffs violate human rights, according to a United Nations panel. Last week, nurses declared the shutoffs a public health emergency. One lawsuit claims the cutoffs are racially motivated. The federal bankruptcy judge said the water crisis further damages the city’s reputation and may stall economic recovery efforts following Detroit’s recent bankruptcy. Detroit’s Water Crisis’ origins go beyond bankruptcy and municipal finance, and its solutions will require empowering city residents, developing dense networks dedicated to identifying and implementing complex solutions and forward thinking that’s deeper than the Great Lakes. This will all require unthinking the current narrative of the water shutoffs, Detroit’s bankruptcy and how Motown got to where it is today. The “Origins of the Urban Crisis” experienced by Detroit and other post-industrial cities lies in the context of structural inequalities created by deindustrialization, racial residential segregation and the postwar regional battles between the declining chocolate cities and their growing vanilla suburbs. The first wave of the current crisis facing cities began with the subprime loan crisis, when banks targeted communities of color with predatory loans. This predatory lending by big banks created the foreclosure epidemic and led to the loss of wealth among Black and Brown families and entire communities redlined all over (again). In many cities, the communities redlined during and after World War II are the same that experienced predatory loans and the foreclosure epidemic. And, many struggling homeowners are still underwater today, despite talks of a housing recovery. These predatory loans and foreclosures devastated financing for local and state governments, as property taxes are those jurisdictions’ largest revenue sources. Yet the narrative around Detroit’s bankruptcy and the water crisis reflect racial and economic antagonism against Blacks and poor people. “They should’ve paid their bill” is one common response, despite the exorbitant rate increases faced by the many un- and underemployed. And a recent “investigative” news story focused on the “scammers” illegally “cashing in” on the crisis by restoring access for residents whose water was shut off. This story feeds into stereotypes criminalizing poor, Black people, instead of focusing on the culprits who caused the crisis. Since March 2013, Detroit has been under state-imposed emergency management, appointed by a white, Republican governor. In addition to being predominantly Black, over 93 percent of Detroit's residents voted for Governor Rick Snyder’s Democratic opponents in 2010. Most residents also oppose emergency management. This scenario undermines democracy and disenfranchises the city's voters. Many activists criticize the governor and his handpicked manager as puppets of the Wall Street speculators who created, and continue to profit from, the foreclosure crisis. Pointing to efforts to privatize the city’s parking system, transportation department, schools, paramedics, Belle Isle, and even the private contractor shutting off people’s water, the recent shutoffs are just a part of a larger plan to steal the people’s assets and privatize natural resources, like the Great Lakes, the largest group of freshwater lakes on our planet. The recent water crisis is due to systematic inequality. The current narrative that suggests Detroit’s residents are corrupt, criminal, greedy, incompetent or lazy is an injustice to the hardworking people of Detroit. Enabled by this narrative, the state's imposition of the Emergency Manager Kevyn Orr undermines democracy and disempowers the people. Solutions require the inclusion of the people. 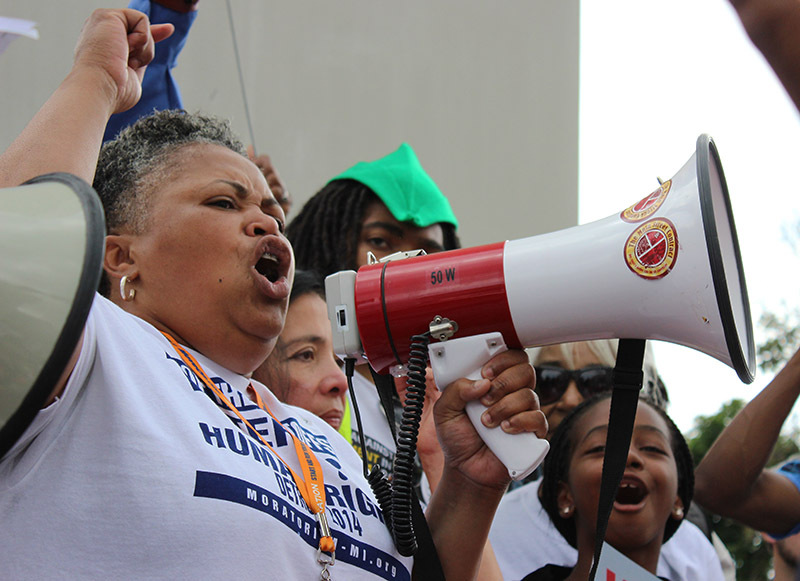 After Detroit's emergency manager Kevin Orr announced funding and programs available to help residents whose water was shut off the day of the protest, on July 21, DWSD announced a two-week moratorium on water shutoffs. However, city crews will still check for water turned back on illegally during the 'moratorium'. This temporary stop-gap does nothing to solve the city’s long-term challenges. The structural adjustment program offered by Orr is unacceptable and will not develop the capacity of the people of Detroit. Privatization as a solution is an illusion. And while well-intentioned, crowdsourcing to pay residents’ delinquent bills does not address the sources of this crisis. The good news is the following: This attack on the fundamental right to water has galvanized activists, bringing together nurses, environmentalists, unions, retirees, welfare rights advocates, foreclosure defense activists and community groups. At the same time as last week's protest, nine people were arrested for blockading the private contractors trucks scheduled to cut off people's water. Wandering through the wilderness of post-industrial Detroit, they are standing up to Pharoah, demanding he let the people's water flow. This alliance can build the community-power needed to enable lasting solutions–like the People's Plan for Restructuring Toward a Sustainable Detroit – for the people, by the people. We must shift the narrative beyond the tides of this current crisis. Instead of focusing on so-called scammers “illegally” hooking water for money, or blaming “greedy” retirees, attention must be paid to structural inequalities fueled by banks, driven by undemocratically positioned officials and enabled by the road laid down by policies. The philosophy held by state officials that holds them superior to Detroiters must be finally and permanently discredited, along with the ideology that residents are unable to govern themselves because they are too poor, too Black or too ignorant. The metropolitan system of first class suburbs and second-class city-citizenship must be abandoned in favor of regional equity. Neither a person’s skin color nor her or his zip code should determine whether she or he has access to water.